It has been estimated that approximately 20% of the workforce in the United Kingdom is disabled, and there is a variety of equipment that organisations can keep on hand to ensure that everyone can fully participate in necessary activities. Proper signs, hearing induction loops, automatic doors, ramps and lifts are all types of equipment that can help people with disabilities to fully participate in an organisation. In fact, under the Disability Discrimination Act (DDA) of 1995, employers, educators and those providing goods and services to the general public must make “reasonable adjustments” to include those with disabilities. Carrying out a Disability Access Audit will help organisations determine if they are complying with this Act and offering the best possible equipment to the disabled. Under the DDA, organisations must display clear signs for individuals with disabilities. Braille and tactile signs would fall into this category. However, organisations will also want to display such signs because their own insurance may not cover them if they have not clearly marked areas of the building, such as stairs and exits in the case of an emergency. Organisations looking to comply with the DDA regarding their posted signs should discuss “DDA compliant signs” with sign vendors. Induction loop systems help to include individuals with hearing impairments who wear hearing aids on a regular basis. These systems pick up sound through a microphone, convert it to magnetic impulses that are transmitted to the telecoil in hearing aids, and then turned back into speech by the hearing aid. These loops meet the DDA’s requirement of “auxillary services” for individuals with hearing impairments. Under the DDA, physical features which create obstacles for an individual with a disability must be removed from or adapted within a building. In the case of doors, automatic doors which swing open without an individual necessarily pushing or pulling them helps to allow individuals of varying ability levels to proceed throughout the building. By installing such doors, organisations help to ensure equal access to all. New buildings which are intended for use or access by the general public must now conform to more recent Part M of the UK Building Regulations which require construction that meets the criteria of the DDA as well. Another type of equipment that helps to allow equal access to all is a ramp. Ramps that cover, or provide an alternate to, steps and stairs allow buildings to conform to the DDA and Part M of the Building Regulations as well. 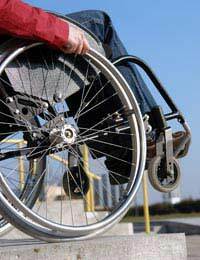 Ramps are not necessarily just for individuals whose disability has led them to a wheelchair, but also for individuals who may have balance problems or physical impairments for which walking up and down stairs would be uncomfortable or a hazard. Another piece of equipment which helps ensure equal access for all individuals is a lift. Both general lifts and wheelchair lifts help allow all members of the public to access a building. These lifts also help buildings meet the requirements of both the DDA and Part M of the Building Regulations. The Disability Discrimination Act of 1995 and Part M of the UK Building Regulations work together to require buildings which are for public use or access to be made accessible to all members of the public regardless of their ability levels. New buildings are now constructed to these standards while older buildings can be adapted to them. A variety of equipment including, among other things, proper signs, hearing induction loops, automatic doors, ramps and lifts all help organisations to meet these requirements and provide equal access for everyone.